When Mayo received a virtual dissection table for its Simulation Center in Florida years ago, IT technical specialist Conrad Dove thought it would be an innovative way to teach anatomy. He soon realized the table could do so much more. Conrad Dove has worked at Mayo Clinic's Florida campus for more than 23 years, mostly working far behind the frontlines of patient care. That changed when Dove moved into his current role as IT technical specialist for the J. Wayne and Delores Barr Weaver Simulation Center in Florida, where he quickly discovered how rewarding it is to be on the patient care side of Mayo Clinic. "I'll never forget the first time I went home, looked at my wife and said, 'Today, I helped save someone's life,'" he tells us. And he's had a chance to say those words dozens of times since, "all because of the amazing tool I've been given to work with." That amazing tool, Dove tells us, is a first-generation Anatomage virtual dissection table that has been part of his life for the past four years. It was originally designed and brought to Mayo Clinic to be a teaching tool for anatomy. Dove tells us he soon realized the table could be so much more and did some experimenting. "I spent thousands of hours learning it inside and out," he says. "We soon realized that we could use the table to do surgical planning on real patients for very complex cases." 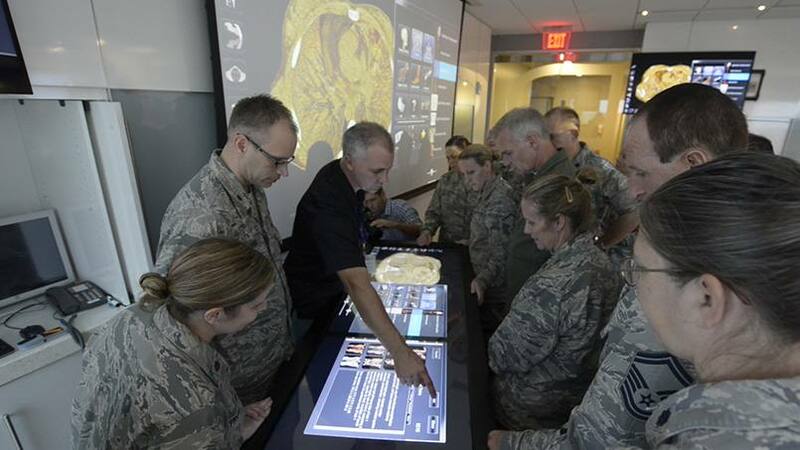 The table can be used to create 3D images that give surgical teams the ability to precisely plan and practice complex surgical procedures before ever touching the patient. "We take DICOM images, which are either CT or an MRI, and put them through an algorithm to create a 3-D object," he says. The table is then used to view the images and cut them as needed. "We can basically dissect a patient in virtual reality and then walk through their surgery several times before ever going into an operating room. It's a pretty impressive tool." And one that Dove tells us has had a big impact on patient care at Mayo Clinic. There was the time when surgeons used the table to help them successfully remove a lesion on a patient's brain stem after other medical institutions had said it was inoperable. And the time Dove and a surgeon used the table to figure out how to remove a lime-sized tumor in a patient's head. And then there was the young patient who had developed a free-floating bone chip inside her skull. "We were able to use the table to identify that bone chip and what needed to be done to correct it," he says. Dove tells us he could go on and on. "Those are just three cases that immediately come to mind in which we were able to dramatically change someone's life," he says. "And in two cases, save someone's life." Which is why Dove was saddened to see the table be put into retirement late last year. "It was a bittersweet moment," Dove says of packing up the table for shipping. "I literally said out loud, 'Goodbye old friend!'" Slow down and do something amazing for us by sharing your comments below. Then, use the handy social media tools atop this page to share this story with others. Learn more about Mayo Clinic Multidisciplinary Simulation Centers.